The Stone Canyon Outdoor EdVentures staff is a group of dedicated and talented outdoor education and recreational professionals. Our administrative team has over 60 years combined experience in the camp and outdoor industry and our Program Instructors were hand selected as some of the best in the nation. Together, our team is taking an innovative approach to outdoor education, summer camp, retreats, and corporate development. Background: Jolee began working in the outdoors as a challenge course facilitator in 1999 and as an outdoor education instructor after college. These experiences sparked a passion for experiential education and its obvious benefits. 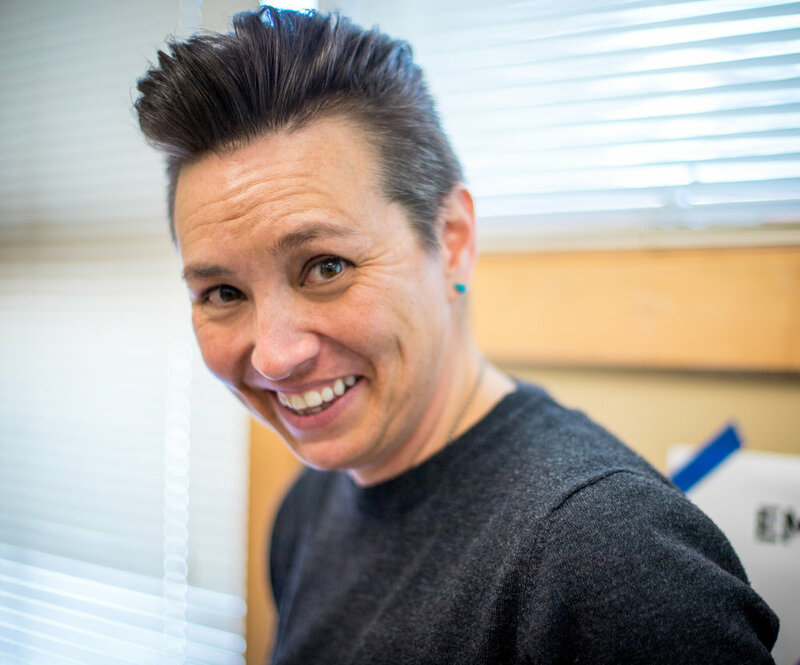 She found her way to grad school to study experiential educational philosophy and methodologies, in particular, project-based learning and student-centered practices. Jolee then landed in the mountains of Southern California where she was the Director and Ropes Director of a private OE center for seven years. In late 2014, she moved to Colorado to join the team at Stone Canyon where she is excited to expand programming and make new connections. Jolee fills her down time with cycling, rock climbing, road trips, and relaxing in her hammock. Background: TJ began his career after college by venturing into the world of day camps and serving as a group leader. He quickly learned that the camp environment is a place for all participants, regardless of their role at camp, to experience continued personal growth from the adventures found each and every day. Since that first summer over a decade ago, TJ has gained valuable experience from positions in and out of the outdoor education industry, including instructor, assistant director, and adjunct professor. In his spare time, TJ enjoys the outdoors by running, hiking and exploring the beautiful state of Colorado and continues to find fun adventures while out driving around in his jeep. Background: Alicia was lucky enough to find her dream job right after graduating high school as a camp counselor. Being a counselor was a challenging and rewarding job that brought her to some of the most beautiful places in the US. Over the past 10 years, Alicia has worked for camps on each coast and many places in-between. She believes that summer camp and outdoor education are important experiences for any child, and the positive impacts that come from an overnight camp experience can last a lifetime. In addition to coordinating the summer camp program here at Stone Canyon, Alicia also works with our outdoor education high school volunteers. Outside of work you can find Alicia hiking, slowly running marathons, and camping with her dog Bishop. Background: Dustin quite literally grew up in the camping and outdoor recreation industry! For the past fifteen years, he has held both front-line and administrative positions in the summer camp and outdoor education fields, and has also been a fifth grade teacher. Dustin believes that outdoor programs, like Stone Canyon, give individuals the opportunity to learn in a new setting, explore their natural surroundings, and take chances. In his free time, Dustin enjoys hiking, rock climbing, skiing, and mastering the art of the power nap. Background: A proud Colorado native, Sonja spent much of her life contributing to the success of her family’s businesses. She managed multiple business enterprises across several commercial industries and service disciplines. Sonja brings her business acumen and skill-set to Stone Canyon with a deep commitment to helping families, children, and her community. Her proudest accomplishment was sharing her family’s culture by working hand in hand with her immediate family to build, and run a Korean BBQ restaurant in south Colorado Springs. In all things important to her, Sonja is driven by her love for her family and community. She uses this dedication to contribute to the Stone Canyon mission, while achieving her one true goal in life - showing her daughters that there is no limit to what can be achieved. Background: Jaime started her career as an elementary science teacher. She has always had a love for science and learning through experiences so teaching science was a perfect fit. After 12 years in the classroom, she had the opportunity to help develop curriculum when Stone Canyon first opened. Once she was a part of the experience, she knew that outdoor education was the place for her. In her downtime, you will find Jaime sharing the outdoors with her son and going along for what ever new adventure he wants to explore that day. Background: Kim grew up with the outdoors and camping as two of her passions. Her family has always worked in food service and she proudly followed in their footsteps. In college, she worked as a food service supervisor. Kim also had the pleasure to work food service with the Seattle Seahawks training camp for two years. Kim has been working for Douglas County School District for 13 years in which she has held various positions, including kitchen manager, district catering manager, and now the Head Chef at Stone Canyon. Kim is looking forward to expanding the potential of the camp with new and exciting classes and adding corporate events to the program. Background: Todd was born in Titusville, FL and moved to Colorado in 1985. After serving four years in the US Navy on two ships he returned to Colorado. Todd then spent 20 years as an electrician before joining the Douglas County School District in 2011. He joined Stone Canyon in 2015 and enjoys supporting the vision of the team.